Select, please, desired possibility of colour. Simple clip on blindfolds on lenses of S10 gasmaks. Colour is optionable. 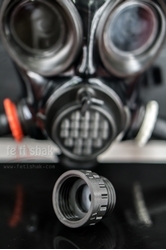 It is set of two blinfolds for one gasmask. This equipment is fetish toy! This product is not intended for any use as rescue, health protection, medication etc. Never play alone with any toys or systems which can limit breath or may have impact on consciousness. We do not cover any responsibility for any health related problems by using any Fetishak gear. For some more possibilities just send us your wishes . Fittings with NATO40 threads for joining gas masks and its accessories with one-way valve. Copyright © 2019 Fetishak. Alle Rechte vorbehalten.